Vo jis mein rone vala ho gaya tha? IB head is changed. If there are tapes then It will be difficult for an officer to release secret tapes of ISI chief and probable PM during an interim set up. Don't you think. What if Nawaz already have a copy of those tapes in his custody? A sitting PML N MNA from Gujranwala holding talks with PTI. But it will be hard to accommodate him because Rana Nazir and his family had joined PTI few days back and they have an animosity towards this group. Furthermore, Rana Nazir's very close relative who is already PTI ticket aspirant is an old time rival of this MNA and he is also very strong. If he had them he would have used them by now. Then he will definitely release these on a widescreen. Remember Senator Mushahidullah interview where he claimed Nawaz was shown those tapes of DG ISI and heard them 2/3 years ago? Mushahidullah had to go home after that interview to BBC. Just a tape means nothing, the talk on them has to show something meaningful. As i said, he would have used them by now. True and i don't think the tape will do that much damage i am more concerned about what Reham is going to write. PTI nowhere in NA 51. Seems like a race between PPP AND PMLN. Last edited by Strike! ; 17th May 2018 at 04:48. I think Reham's book could be a threat but if it's personal attacks then won't make much of a difference. If she managed to steal some party secrets then that could be damaging. As for tape, they would've released it by now if they really had it? I think PTI also had some tapes (or could be just a bluff) so let's see how this proceeds, i personally would urge PTI to avoid getting into cheap games which suits PMLN but not PTI. Today will be a big day for PTI in Jhang with possible joining of 2 MNAs and multiple current/ex MPAs, this would result in 3 way fight now (possibly 4) with news of Sheikh Waqas Akram joining PPP and Faisal Saleh Hayat is also in PPP now. Tough fight between PTI, PMLN, PPP and Independents in Jhang. In Faisalabad, PTI is almost head to head with PMLN now after joining of sitting MNA Ghulam Rasool Sahi and his brother. Won't be surprised if this is the only seat PPP wins from Punjab. That's very well expected since Pervez Ashraf spent billions when he was PM and PMLN did the same to beat him in his own constituency. Last edited by DeadBall; 17th May 2018 at 16:09. 2 MNAs, one MPA from Punjab join the PTI. Habib Akram survey in na 158 puts n league at 51 percent and PTI at 40. @Mian Bharwana family joined PTI, are they influential? Do they bring confirmed seats? She won thrice in a row from Jhang, 2002, 2008, 2013 (different party tickets). There is a lil change in her constituency thanks to delims but i think she will win again. Is there a video link for it? Also, does the survey pertain to the old NA-152 (Multan) constituency? 2 more wickets from Bhakkar coming soon. JKT is doing wonders for PTI and covering all the weak constituencies although he hold no official position in the party. IK really needed a trusted right hand to handle all these constituency issues and JKT proved to be an asset. One bad news from DG Khan is that PTI is giving ticket to Khosa family instead of Zartaj Gul Wazir. I really respect her for the work she did on ground in last 5 years there even after losing election back in 2013. The way she built that constituency and gained support there for PTI with the hard work was really great. She and her husband were always on ground trying to gain more support. In 2013 she got 38k votes on NA-172 and winner got 49k. She is originally from Wazirisitan but settled in DG Khan with her husband. Interesting point to note is DG Khan is one of the most backward Punjab district so you can imagine how hard it was for her to build votebank there as a female candidate. GE2018 will take place on 31st July 2018. DG Khan has 4 constituencies, I am sure there is room for Zartaj in her city constituency. That would be a grave injustice to not hand her a ticket. With the support from Khosas, she can definitely win. After the news broke today, ECP has removed the date from their website. So, uncertainty looms once again. I am all for electables but i hope PTI does not commit such blunder, Imran Khan always supported women directly contesting elections as opposed to quota and Zartaj is one hardworking woman who totally deserves the ticket on merit, even if Khosas can win seat, IK should sacrifice and take risk. I would be HUGELY disappointed if Zartaj Gul and Malik Amin Aslam don't get tickets. I hope PTI doesn't waste time in personal attacks in response to typical FILTH of PMLN. This is reality of Nawaz Sharif. He doesn't even leave backstabbing his country for power so can stoop as low as one can imagine to target his biggest rival Imran Khan. PTI should spend time on aggressive campaign taking their message to masses keeping the media focus on real issues rather than filthy wars. This is very important, these 2 seats simply cannot be won without support from influential candidates, PTI probably has better chance of winning Gujranwala without strong candidate than this. Sanaullah MastiKhel and Nuwani brothers are expected to join PTI, they mostly contest as independents and join winning party. I would prefer Dr Afzal Dhandla who won as an independent and joined PMLN but left the party due to Nawaz Sharif's statement. He seems to be better person (Dermatologist i believe) as opposed to Nuwanis who are typical businessmen. Yea Bhakkar is one of those few Districts left in Punjab where PTI is pretty weak so we need these candidates. Completely agree with you they both deserve it and they even stand a chance of winning these seats for the party. JKT strikes gold in Rajanpur. PML-N MNA along with the runner up of NA 174 set to the PTI. Both are extremely strong candidates. Any ideas as to what JKT's secret to winning over so many electables is? I think runner up Nasrullah Dareshak had already joined PTI but now winner is joining. Good thing is Rajanpur is getting one extra seat which means we can accommodate both Dareshak and Jaffar Leghari and PTI is now in very strong position to win all 3 Rajanpur seats. There are number of reasons, he has political family contacts in South Punjab and i think mainly due to him being a well off industrialist. This is where his background is so important, as good as likes of Asad Umar are but they would struggle to even get 10% of people Tareen managed to get. These influentials/electables dont even prefer working with someone from average background. Even Shah Mahmood Qureshi failed to match Tareen. There is a reason Imran Khan values his contribution and not all the stupid theories about his plane, amazing how he is carrying on even after being disqualified, he has no personal stakes in politics. A bit of warning signs for PTI in Vehari and to some extent Multan (Habib Akram surveys), these strong candidates may not win them seats without fierce campaign especially Janoobi Punjab sooba (only if they think they will make it). In Vehari where sitting MNA Tahir Iqbal joined PTI, PMLN still sitting strong at 55% while PTI is 35%. Tahir Iqbal won seat as Independent beating strong PMLN candidate. PTI vote probably excludes Tahir's personal votebank but still can't be complacent. Similar results in Multan where PTI has another strong candidate Ibraheem Khan who did well even in 2013 but Noon still ahead, Janoobi sooba hype clearly lacking. Most of these surveys are pre-recorded weeks ago. They don't factor in the current political climate. This is why candidates personal vote bank + PTI vote bank is crucial in winning the next elections. So what constituencies are left in Punjab where PTI is weak and has no candidate that was at least in top 2 last time? Honestly, these surveys should be taken with a grain of salt. First of all, they seem pre-recorded, and secondly he asks "who do you think will win?" rather than "who will you vote for?". I don't think it is very representitve of the voting population either, he only goes to market type areas where there are only men, and you only see a very specific segment of society. Nevertheless, PTI shouldn't take any seat lightly. They need to put in all their efforts for every single seat. So when are the actual elections? DD / MM / YY? Kasur, Okara and to some extent Pakpattan & Gujrat (unless we do seat adjustment with PMLQ in Gujrat). Also, not too sure about Lahore where there is plenty of support for PTI but PMLN still way ahead as they have spent billions on infrastructure and now metro train as well. Yep totally agree about the questions, what i was saying is that they need to work as hard as possible as South Punjab is still not how things are in KPK right now for PTI. Also agree with awan that this might have been recorded a while ago. Habib said many days ago that he has recorded shows in DG Khan and still hasn't been aired. Last edited by DeadBall; 19th May 2018 at 23:17. Last edited by Mian; 19th May 2018 at 23:28. Are you saying you are unable to spot the sher? Sialkot and Narowal are right along the border and close to areas where Indians predominantly do their firing/shelling sprees. So, there might be some anti-Nawaz sentiment there after his recent interview. 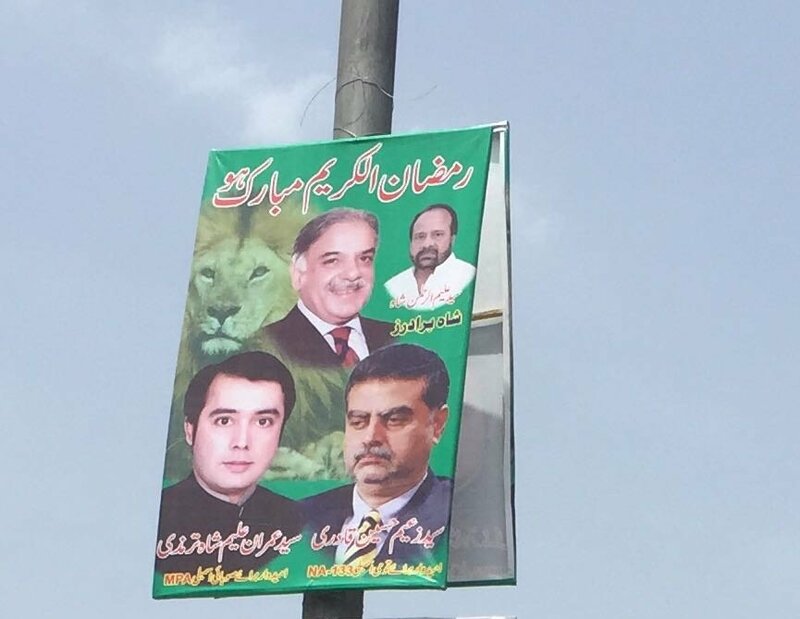 Not sure if this sentiment would translate into an anti-PMLN one though, given that the rural seats of Narowal and Sialkot have been PMLN strongholds for decades. Interesting. Zaeem Qadri has been upgraded to NA. Must be a real dearth of ticket applicants. He is very close to Shobaz and played a bridge role between him and pir sialvi. Zaeem got a bralevi qadri background so they can use him in negotiations with bralevis and on the other side they also got Rana Sanaullah for other sects. Add to the list sitting MNA Usman Ibrahim from Gujranwala who is leaving PMLN and joining PTI (won 5 consecutive MPA elections and 2 times MNA) alongwith MPA 7 times MPA Iqbal Gujjar. And i thought Gujranwala would be last one to fall Now only Khurram Dastagir left with PMLN, who knows! No doubt it would be tough task for PTI to control all these big names with big ego as well. Other thing i am worried about is even if somehow PTI forms federal government, it wouldn't be hugely effective if Shahbaz still becomes CM Punjab as Punjab is more than half of Pakistan and no way PTI is getting Sindh government so not sure how much exactly PTI can achieve. Probably their best bet is institutional reforms? Wow, I'm just shocked at how much of politically unaware these people from much of Punjab and Sindh are. They themselves say everything is bad but will still vote the same exact way again. They don't necessarily need to vote PTI, but no one thinks about holding anyone accountable or why they should/shouldn't vote for someone at all. It's like we have always been doing it this way so we will just do it again this time with out any good or bad reason. The difference between mentality of a KPK voter and other parts of the country is huge. I'm afraid this is the reality for now, these people are too easily impressed by shiny new roads and mega projects like metro to see past their basic flaws. Mizaari was talking about foreign policy in 100 days plan but i hope she is not the upcoming foreign minister because she will be a disaster in that office. SMQ looked like the upcomming interior minister from his speech today but he will be a far better Foreign Minister than Mazaari. Last edited by Mian; 20th May 2018 at 17:39. I came to post just that, so glad IK said it in front of Major Tahir that Malik Amin Aslam is environment minister which means his ticket is confirmed, Major sb can do whatever he wants. Great to see first 100 days plan from PTI and touched some very important points. It was good to hear about Madrassah reforms and focus on extremism and internal security. And yes looks like SMQ as Interior Minister and Mazari as foriegn minister but then Shireen talked a lot about local issues as well so not sure. Better cabinet than any other party can offer. Any idea who is being positioned to be defense minister? Or any good candidates within PTI for that role? I hope IK during his tenure is able to establish a functioning system of understanding between the civilians and military. And as Pakpak mentioned just reading "Imran Khan - PM" felt nice. True it is a great a plan and now PTI is looking like a party to be ruling next. Are there going to be federal ministers for health and education? I know as per 18th amendment it's the duty of provinces to provide these. Another issue is even if PTI form federal government they may not form provincial governments in Punjab and Sindh and hence cannot "perform" as per their liking. QWP MPA quits party, joins the PTI. In my opinion, just get elected now and then you can clean house later. Although IK is demonstrating his intentions and sending out a clear message to the lotas that they won't be humored or accommodated later on either. All times are GMT 5.5. The time now is 23:41.